A kidney transplant patient claims that AstraZeneca allegedly failed to warn the public about the potential for Nexium to cause kidney problems, including renal failure. Among other things, the lawsuit alleges that AstraZeneca had received numerous case reports of kidney injuries in patients that had used Nexium as early as 2004. Yet the company aggressively marketed Nexium, with sales of the medication peaking at $5.7 billion in 2005. The Plaintiff further claims that had he and other Nexium users been provided with proper warnings about potential kidney risks, they may have been able to avoid severe and potentially life-threatening renal injuries. "Our Firm is beginning to receive inquiries from individuals who allegedly developed kidney failure, chronic kindey diseases and acute interstitial nephritis due to their use of Nexium and other proton pump inhibitors. Though this is only the first Nexium lawsuit to put forth these types of allegations, we expect that many similar cases will be filed in the future," says Sandy A. Liebhard, a partner at Bernstein Liebhard LLP, a nationwide law firm representing victims of defective drugs and medical devices. The Firm is currently investigating potential legal claims on behalf individuals who may have suffered serious kidney complications due to their use of Nexium or another proton pump inhibitor. Other versions, including Nexium 24HR, Prilosec OTC, and Prevacid 24HR, are available over-the-counter. Since 2014, the labels of Nexium and other proton pump inhibitors have made mention of acute interstitial nephritis, a serious kidney injury seen in some patients using the drugs. The condition causes inflammation between the kidney tubules, and is often the result of a sensitivity reaction to a medication. Acute interstitial nephritis can progress to kidney disease and renal failure if it is not recognized and treated. Last month, a study published in the Journal of the American Society of Nephrology suggested that extended use of proton pump inhibitors could be associated with a 96% increased risk of renal failure and a 28% increase in the risk for chronic kidney disease when compared to a class of heartburn drugs called H2-blockers. The study drew data from the Department of Veteran Affair national databases, and followed 73,321 proton pump inhibitor uses and 20,270 H2-blocker patients for five years. The risk for these kidney complications increased the longer a patient had used proton pump inhibitors. Research that appeared in JAMA Internal Medicine in January also found that proton pump inhibitors might increase the risk of chronic kidney disease, perhaps by as much as 50%. The findings were based on an analysis of medical records from more than 10,000 patients treated in community-based settings, as well as 248,000 people treated in a Pennsylvania hospital system. 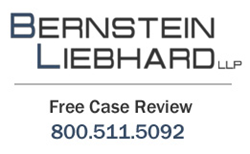 Bernstein Liebhard LLP is now offering free legal reviews to individuals who developed renal failure, chronic kidney disease, or acute interstitial nephritis that may be related to their use of Nexium or another proton pump inhibitor. To learn more about Nexium and kidney failure, please visit Bernstein Liebhard LLP's website, or call 800-511-5092 to arrange for a free, no obligation case review. Bernstein Liebhard LLP is a New York-based law firm exclusively representing injured persons in complex individual and class action lawsuits nationwide since 1993. As a national law firm, Bernstein Liebhard LLP possesses all of the legal and financial resources required to successfully challenge billion dollar pharmaceutical and medical device companies. As a result, our attorneys and legal staff have been able to recover more than $3.5 billion on behalf of our clients. Bernstein Liebhard LLP is honored to once again be named to The National Law Journal's "Plaintiffs' Hot List," recognizing the top plaintiffs firms in the country. This year's nomination marks the thirteenth year the firm has been named to this prestigious annual list. ATTORNEY ADVERTISING. © 2016 Bernstein Liebhard LLP. The law firm responsible for this advertisement is Bernstein Liebhard LLP, 10 East 40th Street, New York, New York 10016, 800-511-5092. Prior results do not guarantee or predict a similar outcome with respect to any future matter.